On Saturday Sept 21 is the 9th Annual Highland Avenue Car Show & Festival from 9am-2pm at the Highland Avenue Community Church, 9944 Highland Ave in Rancho Cucamonga. For details on this show go to their website at www.highlandautoshow.com and if you'd like to participate in this show you can come by our location and pick up an entry form. On Sunday Sept 29 is the Bob's Big Boy Car Show at 3521 Hamner Ave, Norco from 5pm-8pm. This is a great show with lots of hot cars, cool music and don't forget the great Big Boy burgers & shakes. I would highly encourage anyone looking to get into car participating in a car show to enter this one, you can contact Charyle at trollady10@aol.com for details. If you have a show or event coming up and would like me to promote it in my newsletter just email me at caeperformance @aol.com with all of the details. 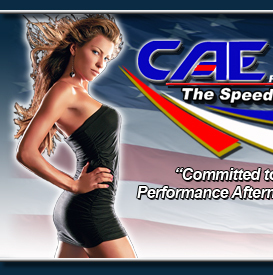 You can also keep up on any news during the month on our FACEBOOK fan page by clicking the link on our website HOME page at www.caeperformance.com I am also now on TWITTER, so "tweet" me at @caeperformance We would like to wish you all a Happy Labor Day on Monday Sept 2, for all of you who get a 3 day weekend...ENJOY!!!!!! !